According to John Chilton's Who's Who Of British Jazz, Steve Lane was born in London in November, 1921. His father was a concertina player who recorded with the Rio Grande Tango Orchestra in the 1920s. Steve played cornet and guitar and is recognised for his work as an arranger, bandleader, record label owner and jazz magazine producer. Here is Steve Lane and his Famous Southern Stompers playing Dr Jazz. 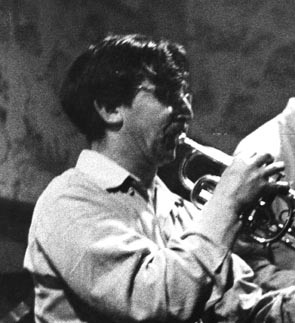 The death of Steve Lane at the age of 93 on 22nd August 2015 marked the end of a unique British jazz life. Although he had been musically inactive for the last few years, his was a long and notable contribution to the revival of, and in the maintaining of interest in, traditional jazz in Britain in the years following World War II. From the formation of his Famous Southern Stompers in 1950, until the last performances of his Red Hot Peppers in the first decade of this century, Steve led bands which always displayed his uncompromisingly high standards of musicianship and integrity. Steve Lane was born on 21st November 1921. Having heard his first jazz in the Rhythm Clubs of the late 1930s, Steve’s first choice of instrument was guitar, but, following wartime service, he switched to the cornet on which he soon developed a jazz style based on the hot trumpeters of the 1920s he so much admired, with particular emphasis on his role leading the collective ensemble. Never the greatest technician, and with a limited range, he was nevertheless capable of generating great energy and swing, as well as musical precision, as he led his ensembles through their extensive repertoire of rags, stomps, blues and standards. In two other respects Steve’s bands stood out from the general run. The first was in his use of original material – he was a gifted composer of vocal and instrumental pieces, probably numbering a hundred or more, most of them memorable. The other was in his use of female vocalists as an integral part of the band, presenting a range of songs carefully chosen to showcase the singer, and with the supporting musicians strictly trained in the art of accompaniment. I did two major stints with the band – first in the late 1960s, and again a decade later. You never earned much money, you were required to attend weekly rehearsals, and you had to be prepared to adapt your ways of playing to meet Steve’s demanding, and often idiosyncratic, musical objectives. Due to all these factors personnel changes were frequent, and rehearsals sometimes acrimonious, but Steve, undaunted, always found new players to take on, often discovering youngsters in their very early stages of development. Many of his young protégés, such as pianists Martin Litton and Bruce Boardman, and trombonist Bob Hunt, moved on to become seasoned professionals, but I know that they, along with everyone who passed through the ranks, will acknowledge Steve’s role in their futures. Standing Left to Right: Gerry Ingram, Bob Beardsworth, John Keen, John Wurr, Martin Litton, Barbara Passanisi. 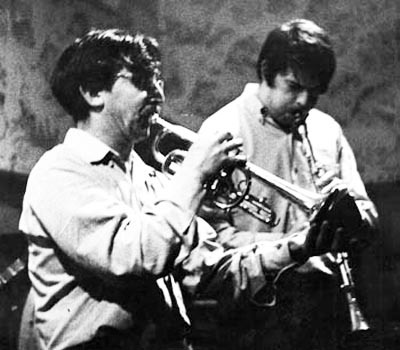 Seated: Steve Lane and Geoff Walker. 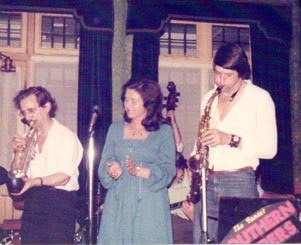 We should also remember Steve’s partnership in the VJM Record label, which made available much previously unreleased vintage jazz material, and also his role in founding, in the 1960s, the consortium of bands and clubs known as the West London (later British) Jazz Society, together with its supporting magazine, Jazz Times. This was a life very much devoted to the performance and promotion of the music he loved. A committed egalitarian, and a one-time Communist who addressed everyone, irrespective of race, creed, gender or station in life as ‘mate’, Steve had a profound distrust of authority, and in particular all politicians and traffic regulators. He nevertheless was difficult to get to know personally, living a fairly reclusive domestic life in a gloomy North West London house with his elderly mother and mentally ill brother, both of whom pre-deceased him. Sadly, in his last years, as physical frailty and dementia took their toll, he became isolated from his few remaining musical friends. So I, along with many of his ex-musicians, was pleased to make it to his funeral at New Southgate Crematorium and to play in the parade band organised by Bob Hunt. Here are Steve Lane and his Famous Southern Stompers playing Streamline Train. John Chilton's book records how Steve's band was billed as the Red Hot Peppers from the mid-1980s and that during the 1990s they toured Europe with gigs in Czechoslovakia, Holland, Denmark, Poland and Belgium. Steve also led and recorded with the VJM Washboard Band. 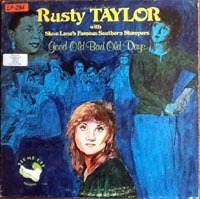 We can listen to Rusty Taylor singing Shine with Steve's Red Hot Peppers at the Joseph Lam Jazz Club in Amsterdam on 8th January 1982: Rusty Taylor (vocals), Steve Lane (cornet, leader, arranger), Paul Harrison (clarinet), Bob Beardsworth (trombone), Colin Knight (piano), Geoff Walker (banjo), Keith Feinson (string bass) and John Keen (drums). Thanks so much for your profile of Steve Lane. I am his cousin, and spoke first at the funeral. I also made several audio recordings, of the service itself and of various conversations afterwards, there at the crematorium and later at the Fox and Goose. These are accessible if people would like to listen to them (click here). Also there are one or two videos, including the funeral procession, a most interesting letter written to me by Steve in 2001 and high fidelity transcriptions of a couple of master tapes recorded by Steve. There was a treasure trove of these master tapes, of which I was offered two to see if I could get them digitized (which I did, by The Great Bear. Unfortunately, while that was being done, there was some pretty heavy rain in Kenton and, apparently, the contents of Steve’ garage, including the remainder of those tapes, were soaked. Without my knowledge, the lot was trashed. Truly a tragedy. Anyway, there are those two left. One is a 1987 recording session with, I guess, Red Hot Peppers and the other a session with Duke Ellington. You can download them in any of three different levels of fidelity. Although Steve's band played at the Ken Colyer Club, his style was very different. They did! Roger Trobridge took this video of the traditional procession for Steve's funeral held at New Southgate Crematorium, London N11 on Monday 7 September 2015. 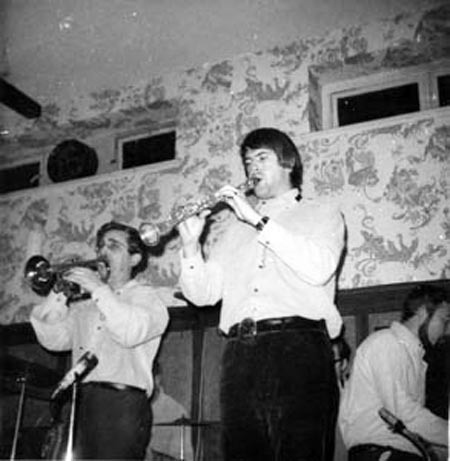 All the musicians participating were members of Steve's band at some point during his nearly 60 years as a band leader. A while ago, Roger Trobridge also recorded Steve Lane talking about harmonica player Cyril Davis and two numbers Tennessee Twilight and Hear Me Talkin'. Cyril played banjo with the Steve Lane Band. Roger shares this recording with us - the piece with Roger talking to Steve is at 6.30 minutes into the 50 minute programme. with Pam White singing the song. 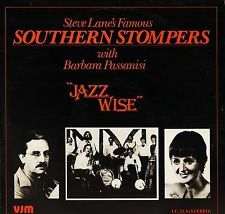 John Westwood writes: 'Steve Lane's 'Famous Southern Stompers' was one of the very few bands that could play across the styles without trying to copy anyone or anything and still produce what many of us call 'Proper Jazz'. Fully paid-up 'Mouldy Fygges' will know there are many who don't agree on that point, of course. Steve's repertoire ranged from Jelly Roll, Louis, ODJB, Ma Rainey, Jug/washboard band, Lu Watters, Condon, even Charlie Parker and the Beatles - not to mention classical, opera, military pieces and many others... plus his own compositions. Very few bands have ever achieved this with any success and it seems that there just aren't any today, more's the pity. His later "Red Hot Peppers" band was rather less successful in this regard, and sadly his work has never been fully recognised, or indeed, publicised. Steve also produced LPs and CDs on his own 'Azure' and the 'VJM' labels, but these never got into mass circulation, and are today very much collectors' items. So he might be gone - but he won't be forgotten. Here is Steve Lane and the Famous Southern Stompers again, this time playing Who'll Chop Your Suey When I've Gone? 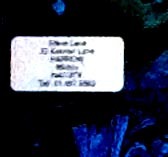 In a charity shop in North London a few months ago I came across a small collection of jazz LPs, all with hand-written numbers stuck to the top left of the sleeve and some with printed labels giving an address in Kenton Lane, Harrow, and (on a few of them) the name Steve Lane. Closer inspection revealed recordings by Steve Lane's own bands, along with re-issues of recordings by high profile names such as Duke Ellington, Jack Teagarden and Fletcher Henderson, and more obscure (to me at least) names including Maggie's Blue Five from Sweden, and John Deffray's Creole Jazzband, from Chatham. All the LPs (I have about 20) are in excellent condition though a little dusty, and some of the sleeves show signs of foxing. The numbering runs from 141 to 451, so there are a lot more records out there somewhere. Many of the recordings are on the VJM label. Three are on Czech label Supraphon, including Beryl Bryden with the Prague Dixieland Band, and Czechoslovak Journey by Graeme Bell and his Dixieland Jazz Band. 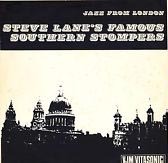 Two LPs, one by The Frog Island Jazz Band and another by Steve Lane and his Famous Southern Stompers, are on the Stomp label, "produced on a non-commercial basis, in limited editions, for the benefit of collectors, enthusiasts and connoisseurs." One of my favourites is a 1974 Retrieval label collection of recordings made in London in 1927 by Charles Remue and his New Stompers Orchestra, described in the notes as "the first jazz recordings known to have been made by an exclusively Belgian unit." Reading the addresses of the various record companies - Enfield, Harrow, Kingsbury, Pinner - you get the impression of a cottage industry run by enthusiasts beavering away from their homes on the north-western fringes of London. At the time I bought the records I knew nothing about Steve Lane, other than that he was a jazz player. There was little information online and the reference books carried only brief mentions. It was clear he would be in his nineties and unlikely to be still playing, but I had the vague idea of knocking on the door of the house in Kenton Lane to see if it led to anything. Before I could do so I learnt the sad news of his death, via the London Jazz News website, and was then fascinated to read John Wurr's profile published on your site and to discover so much more. I will probably go and take a look sometime at the house that was the home of Steve Lane and his records, and give thanks for the man and his music. 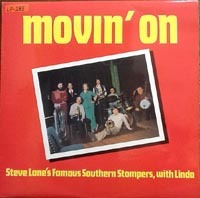 As I write, Steve Lane, backed by John Wurr on alto clarinet, is on my turntable singing "Someday Sweetheart" from the Southern Stompers album Movin' On (number 283), recorded at the Railway Hotel, Greenford, in 1977. 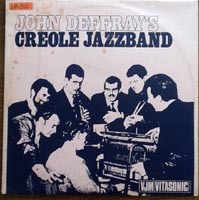 Regarding Richard Thomas's piece about Steve Lane LPs - John Deffray’s Creole Jazzband wasn’t from Chatham – they were a London based band run by clarinettist John Defferary – formed in the mid 1960s, they had a regular Monday night at The Whyte Hart, Drury Lane, London, played the Faversham Jazz Club (at the Fleur De Lis pub) on a Tuesday night and other clubs on the West London Jazz Society’s list on other nights. The LP shown VJM LC7 is in my collection. My brother Mick Lay played drums in the band. Rest of the line-up: - Roger Link (bass), Harmer Johnson (piano), Dave Carpenter (trumpet), Barry Weston (trombone) and Brian White (guitar). Pleased to say all these guys are still alive. 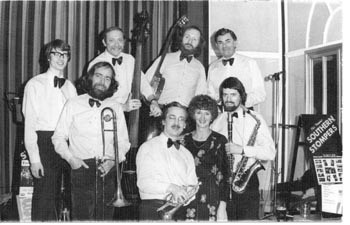 Adrian and Kay McGrath moved to Andalucia from Hertfordshire but still recall those days listening to Steve Lane's band. (Click here for our Profile of Steve Lane). 'In our teens and 20's Steve Lane was the highlight of our social life in the 1960s. He was a regular feature of our Saturday nights - in Barnet, at the Oddfellows Hall in Rickmansworth, a pub we can't recall on the North Circular and The Red Lion at Welwyn. We know we must have been at the same performances many times between 1960 and 1975 but never actually met until 1976. Our shared appreciation of Steve´s music was a significant element in establishing our relationship. 'We both remember how his trousers always seemed too short - about 6 inches above his shoes! He did recognise his regular fans and always called you "mate". We also heard Acker Bilk, Kenny Ball, Chris Barber, Temperance Seven etc... but apart from Steve Lane, only Chris Barber "did it" for us. We were once at a Young Conservative dance (ugghh - but they were good places to meet people) in one of the Heathrow Terminal buildings. We chatted briefly to Chris Barber and Ottilie Patterson. He said that he had once played a concert with Steve Lane in the late '40s or 1950s'. 'You may be interested to know that we have just uploaded 15 videos of the entire Wembley Wiggle LP from the early 1960s with Pam White. 'When Steve recorded Wembley Wiggle, Richard Grandorge interviewed him. He said: "Your band certainly produces a different sound from the Trad-Pop bands". Steve Lane claimed that unlike most Trad bands of the time he stuck to the "clean ensemble of classic New Orleans jazz where musicians actually listened to each other and fitted in". 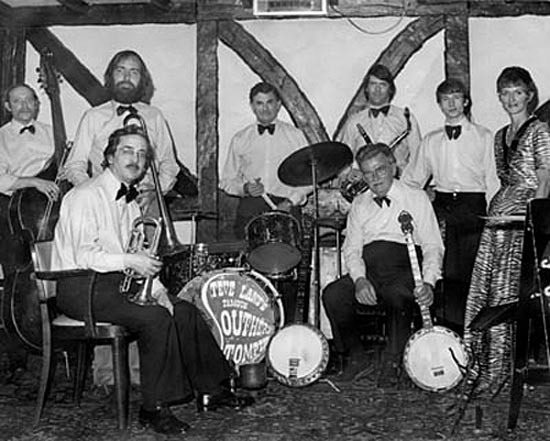 Grandorge asked: "What went wrong with British Trad-Jazz after the early 50s?". Steve Lane replied " Well, I think it was this. There were too many bands, several of some quality, which lowered their standards to increase their already satisfactorily commercial value." "Money again?" " Yes Mate, that same old filthy lucre". 'There was a record shop we liked at 77 Charing Cross Road called "Dobells" - run by Doug Dobell. He used to produce Steve Lane (and others) on 77 Records. We still debate who was best (and most like Bessy Smith) of Steve's singers ... Pam Heagren, Pam White or Rusty Taylor (Kay backs Rusty, I liked Pam Heagren best)'. If any other readers are able to add any information, anecdotes or pictures to this profile of Steve Lane, please contact us.